In a way I’ve copied one of my booze related goals from recently elevated Malt Maniac Keith Wood – to try as many whiskies from as many distilleries as I can. I may have started along that route before I saw Keith’s website but it’s an admirable goal that I’m pleased to be sharing. Along with my visits to the SMWS to try weird single cask bottlings and my attendance of The Whisky Exchange and Whisky Squad tastings I was rather pleased to see that Dominic Roskrow‘s whisky tasting club had branched out from Norwich to the online world and fired up TheWhiskyTastingClub.co.uk. 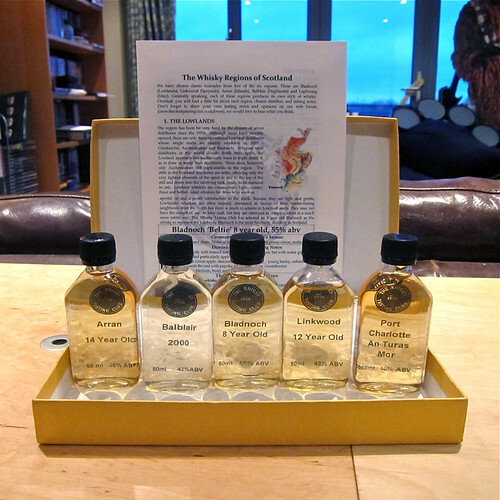 They have various whisky tastings sets that you can buy, but I decided to go for the thing that attracted me to them in the first place – regular sets sent out to you on a monthly, bi-monthly or quarterly basis. I went for the bi-monthly sets (as I have only one liver and too many things to drink in London as it is) and set up a standing order to kick them £28 every couple of months (£25 + £2.95 P&P for 5x50l samples). After a couple of mails back and forth I heard my first set was being sent out (back at the beginning of November in the middle of Dominic’s run through whisky dinner – the real one is coming up soon) and they arrived a few days later. One of the reasons I like the idea of a tasting by post is that it meant I could stretch the drams out over a few nights, and could also leave them for a few weeks to fit in with my rather boozy autumn. I’ve finally got round to writing this up just as my second set appeared in the post. Along with sending out the tasting boxes they have a forum on their site for everyone to share their tasting notes, as well as the usual whisky chat, which will hopefully fill in the gap that not necessarily being around others drinking the whiskies leaves – I can’t wave my arms around and mumble about whisky on the internet, so it’s a bonus for everyone. I will hopefully have a copy of Dominic’s book appearing early next year as a thankyou for signing up for the regular sets and there are tales of bonus drams making their way out as well – I’m looking forward to seeing what happens. This first set is an introduction to the whisky regions of Scotland and I was quite pleased to see that I’d only tasted two of the provided whiskies before, and one of those was one I very much wanted to try again. I went with the traditional light-heavy ordering and started off the lowland of the box – Bladnoch ‘Beltie’ 8 Year old. Named for the Belted Galloway cow on the label, a rare breed from the area around the distillery, it’s bottled at 55%. On the nose it had hint of farmyard – silage and mulching grass, which faded as it sat in the glass to be replaced by vanilla, linseed oil, candle wax, apples, foam strawberries, a hint of cinnamon and digestive biscuits. To taste it had big woody start and finish, with liquorice root at the end. A big booze hit was joined by pine & mint and a little bit of fruitiness in the middle – apple pies and unsweetened buttery mince meat, although unsweetened. It could take quite a bit of water, softening the flavours into black forest gateau, although the bitter liquorice remains at the end. The finish had some longering pear and apple. There was a surprising amount to the whisky, especially for an 8 year old, but it was maybe a little bit woody on the taste for my liking. The nose was excellent, however, and I’d almost be tempted to buy a dram for the smell alone. Next I went for the Speyside – Linkwood ‘Flora and Fauna’ 12 year old. Bottled at 43% this is part of a range of whiskies released originally in the 90s by United Distillers (who are now part of Diageo) to show off the range of whisky styles in Scotland. It seems they weren’t one-off releases as some of them are still available for a reasonable cost, including this one – one of the only distillery bottlings of Linkwood available (although they are much loved by independents). On the nose an initially pungent mulchy grain quickly floated off to reveal fruit and grain underneath – barley and granny smith apples with a hint of Refresher chews. The taste was very light and thin, initially sweet and creamy with a hint of stewed and crunchy apples moving on to a more woody middle with vanilla and wood spice. It finished with a mix of barley and sharp apples. Water nrought out more spice on the nose and more sour fruit to taste, with hints of grapes and some sugary sweetness on the finish. This was fine but nothing earth shattering and maybe a little light in flavour for my liking, although I liked it much more on my second tasting (finishing the other half of the 50ml sample when I started writing this blog entry). I then moved on to the island contribution – Arran 14 year old. Bottled at 46% this is the latest regular bottling to be released from the distillery – as they were founded in 1996 it’s obvious to see why it hasn’t appeared before. On the nose it had sweet pears, grass, lemons and brine. To taste it had the traditional Arran burst of icing sugar followed by wood polish, prickly spice, chocolate orange and vanilla. Water added some more sugary sweetness, an unexpected savoury note, floral overtones (orange blossom?) and a touch of minty menthol. I like Arran whiskies and this is the one that I wanted to try again, having only tried a drop at Whisky Live Glasgow a few weeks after the bottled it. This is definitely an evolution of their previous whiskies and one that I’m tempted to buy a bottle of. It’s still not a patch on the SMWS single cask bottlings that I tried a year or so ago – those are still some of my favourite whiskies of all time. Next was the highland whisky – Balblair 2000. I tried this as part of the Twitter tasting I did last year and didn’t get much different from it this time. On the nose it had pineapple, vanilla, a hint of meaty anis, and rhubarb and custard sweets. To taste it had caramel with sweet vanilla, dark chocolate, just unripe vine fruits and a hint of pepper. I didn’t get the coppery note that we found last time so much this time, but I did still find a bit of dry twigginess in the finish. Water brought out more vanilla but also more astringent alcohol on the nose. The taste changed quite a bit, with more heat, more thin alcohols and more big wood, with thick custard at the back of the mouth. The final whisky of the evening was the one from Islay – Port Charlotte An Turas Mor (The Great Journey). Part of Bruichladdich’s heavily peated range named for the long closed Port Charlotte distillery, this is the newer reasonably priced expression, as earlier releases have fetched a bit of a premium from the ‘Laddich lovers and also been bottled a lot stronger. On the nose there was initially a hit of baby sick, but this faded after pouring into sweet peat and muddy grass. There was also coal smoke, sweet oranges and tangerines. The taste was first dominated by big coal smoke fading away to be replaced by sweet fruit, lemon, and a dry woody end. Water adds some sweetness and a lot more citrus – the smoke is still there but hangs around out at the end rather than up front with some dusty coal powering it. A nice first box, full of slightly more interesting drams than you’ll often find in a regular region sampling whisky flight. My next box is whiskies of the world, which I hope to get on to slightly faster than this one. Lowland single malt Scotch whisky, 55%. ~£35 at Master of Malt. Speyside single malt Scotch whisky, 43%. ~£40 at Master of Malt. Island single malt Scotch whisky, 46%. ~£40 from The Whisky Exchange. Highland single malt Scotch whisky, 43%.~£30 from The Whisky Exchange. Islay single malt Scotch whisky, 46%. ~£35 from The Whisky Exchange. Feel free to use the picture, if you click through to Flickr there’s a bigger version. thanks, I’ve put the photo up on facebook. btw, thanks for posting on the forum, we have had a spam problem of late but hopefully I’ve fixed it now, more comments most welcome!